The latest blow: The Washington Post reporting Warren wrote "American Indian" as her race for her State Bar of Texas registration card in 1986. It marked the first known example of Warren making such a claim in her own handwriting. She apologized Tuesday in response to the report for identifying herself with that race, both then and when she taught law at Harvard and the University of Pennsylvania. May 14, 2016: Trump refers to Warren as "Pocahontas" in a New York Times interview. He's since tweeted the attack 15 times and repeatedly referred to her by the name in rallies and speeches. Most Americans think of the 1995 Disney movie when they hear the name, but the film sharply diverged from the historical record about her. Native Americans groups have expressed their view that Trump's use of the term is offensive and it's frequently called a slur in media reports. 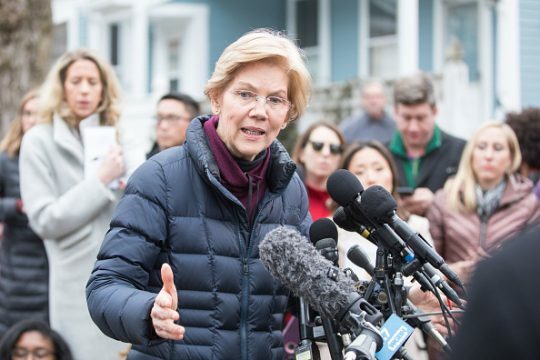 Feb. 6, 2019: Warren tells reporters she's apologized for not being more "sensitive" about the distinction between her claims and what constitutes being in a tribe. This entry was posted in Politics and tagged 2012 Election, 2020 Election, Donald Trump, Elizabeth Warren. Bookmark the permalink.